In ancient Rome, Gladiators were armed combatants who would fight, often to the death, to entertain. Gladiator in latin means ‘swordsman’, derived from the word gladius (sword). Gladiators were introduced to Rome in the 3rd Century BC and reached its peak between the 1st century BC and 2nd century AD. However, the gladiator games lost their popularity towards the start of the 5th century. 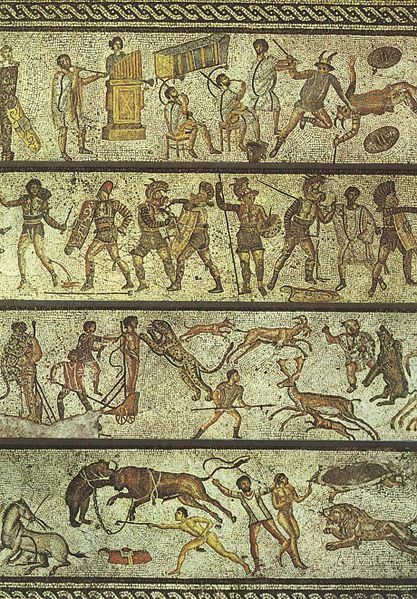 Gladiator games (called ‘munera’) started as ‘duties’ paid to the dead ancestors but gradually lost their connection with the funeral of individuals. They became important public spectacles, which were staged by the politicians and the emperors. The popularity of gladiatorial games was enormous and famous gladiators became idols to the public. Gladiators came from diverse backgrounds. Usually, Gladiators were men, but there could also be women. Most of the gladiators were prisoners of war or slaves and thrown in to the arena unwillingly, but their number included emperors. Free men, who were in dire need of money and lacked other means of support, voluntarily took a career as gladiator in hope of winning enough money and earn freedom for themselves. As these games became more popular, many people later on joined to become gladiator for the fame and heroic status attached with the games. These men wanted to be popular and being a gladiator did offer a chance to become one. Anyone who chose to become a gladiator was considered to be beneath the law and not a respectable citizen. Though a few upper-class people did compete in the arena, but they did not live with other gladiators or like other gladiators. All gladiators were supposed to take an oath that they will endure to be burned, to be bound, to be beaten and to be killed by the sword. Gladiators were trained in special training schools and the trained gladiators had a better chance of surviving the games and even thriving. Some gladiators had to fight no more than 2 to 3 times a year and top ones became popular heroes. Skilled gladiators stood a chance of winning good amount of money and even the wooden sword (rudis) that symbolized freedom. Freed gladiators either became trainers in the gladiatorial schools or bodyguards for wealthy individuals. Thracian – These gladiators wore huge crested helmet with visor, high greaves on both legs, arm protectors and sported a short, curved sword. Retiarius – These gladiators were net and trident fighters. They wore minimal amount of armor on the body and their head and neck used to be uncovered. Lack of armor made them more mobile and they used running as one of the tactics to fight against the opponents. Secutor – They were generally paired with Retiarius and were often referred to as chasers. They had egg-shaped helmet with eye holes. For protection they had greaves on one leg, arm protector and legionary-style shield and sword. Bestiarius – They were special type of gladiator trained to fight and kill various types of animals. They were the lowest ranked gladiators and did not become as popular as some other types of gladiators. These gladiators were mostly without armor and were equipped with whips or spears. Most gladiator fights were conducted between different types of gladiators with different set of fighting equipment and armor. The manager or trainer of a gladiator group was called a ‘lanista’. He provided lengthy and arduous training in schools (called ‘ludi’), especially designed for this purpose and they were usually located near the great amphitheatres. At the peak of the gladiator games, all the gladiatorial schools in Rome were under direct control of the emperor. The biggest of these schools, the Ludus Magnus, was located in the vicinity of the Colosseum. This school even had a mini amphitheatre for practice and it’s remains can still be found. The gladiator fights took place at arenas or amphitheatres. In the beginning, only privileged people were allowed in the arena, but over a period of time gladiator fights became a ticketed system. Gladiatorial games were kicked off with elaborate procession that included contestants and the sponsors of the games. The morning events used to begin with mock fights. These were followed by animal performances, where trained animals were featured to perform tricks. Also, exotic animals were pitted against each other for fights or they were hunted by Bestiarii. During the lunch break, criminals were executed in the public arena. They were thrown in front of animals or were pitted against gladiators where their chance of survival was very low. The afternoon session used to be the high point in the games that involved individual gladiatorial combat. In these matches, Gladiators with different combat styles and varied armor and weapons were pitted against each other. During the match, many rituals were followed in the arena, like holding up the index finger when the gladiator was wounded to concede defeat. According to written evidence, ‘pollicem vertere’ (that includes turning the thumb) used to mean kill whereas ‘pollicem premere’ (that involves pressing the thumb) meant spare. People who turned or waved their thumbs meant that they want the gladiator to be killed; and people who wanted the gladiator to be spared would press their fists. In the end, it was sponsor’s decision whether to give life to the gladiator. Since many centuries, gladiators have fascinated people, especially when they were fighting against cruel masters. That is the reason why character gladiator was introduced in many movies and was applauded by the audience. 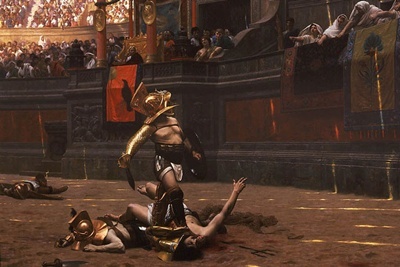 Gladiator has been visualized in various art works of artists of Rome. Roman culture and art depicts the image of gladiator in their work. Paintings of gladiators were used to decorate the walls. 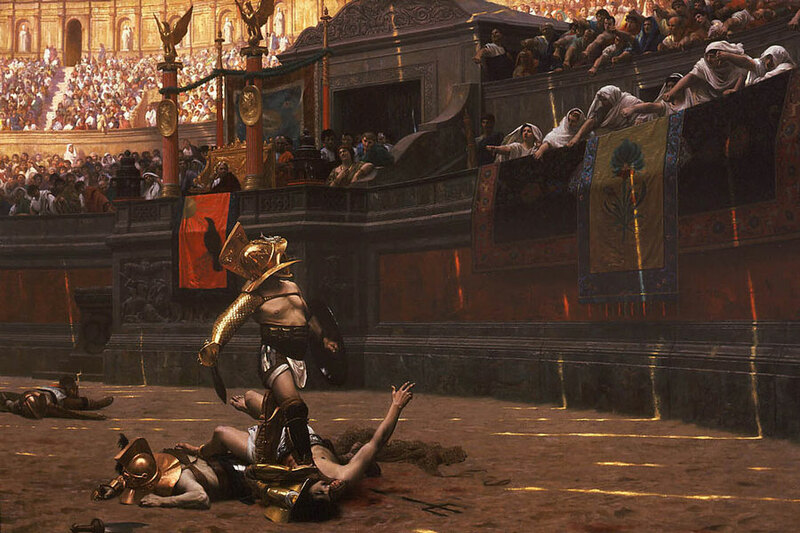 ‘Pollice Verso’, Gerome’s painting beautifully portrays the image of rebellious gladiator. Wall paintings, lamps and ceramics made during the Roman Empire reflected the popularity of gladiatorial combat. Despite the fact that gladiators disappeared several centuries ago, their stories still continue to fascinate us.